Oh if only I had known! Do young people care about learning foreign languages? Having read the article published by The Guardian on students in the UK, ‘Do young people care about learning foreign languages?’ with a resounding NO echoing throughout the passage, it was hard not to just think… ‘oh, that’s a shame’ but also feel a deep sense of frustration. What appears to be an ‘on the whole’ blasé attitude to learning a foreign language could not only inhibit cultural understanding but also future progression and opportunity. With the statistics in the article stating that 48% of those surveyed claim that learning a language is ‘too difficult’ and 40% stating that it is ‘too hard’, would suggest that those questioned, were just as much confused by language learning as they were between synonyms. This is not helped by the recurrent theme of English being the ‘global language’, giving an air of superiority if your mother tongue is English, which seemingly, is being rubbed off on 39 % of the surveyed children who say that ‘most people speak English’. Of course, can you imagine their faces when you stated the real facts that actually, Chinese has over four times as many speakers and that Spanish has more speakers than English too?! 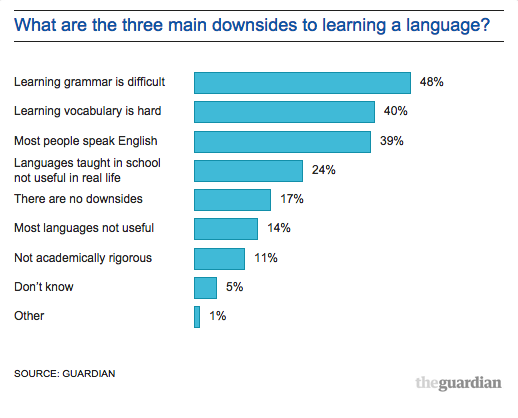 This negativity has meant that studying and pursuing language education in the UK has plummeted. The answers… make languages compulsory in UK schools? Provide extra tuition for those struggling? According to the Guardian, it would appear that "whatever particular policies on language learning have been in force, there has always been a struggle to convince learners of their value. Even when languages were compulsory in the late 1990s, a large number of pupils abandoned them or achieved very little." The irony being that languages can be one of the most invaluable tools to have in your life, which worryingly, most people do not realise until it becomes even more ‘difficult’ to learn, when your brain isn’t young and spongey as it is in your primary/ secondary school education. How many times has someone said to you “I would love to be able to speak another language!”? How frustrating can it be sometimes when you are not able to communicate effectively with someone? It is important not to forget that languages are not just a tool for communication but that they can introduce you to a new culture, widen your social network and according to scientists, even increase your brain power. Of course, this is without the huge employability prospects it can provide. There are thousands of job opportunities all over the world including in the UK, some of which can be found on our very own Jobboard at multilingualvacancies.com. These jobs can provide careers and for those who desire to; a career of internationalism, monetary rewards and infinite opportunity. Perhaps the answer to encouraging students in the UK is to make them understand the real significance of being a linguist. Learning a language Like Frank Smith said, “One language sets you in a corridor for life. Two languages open every door along the way.” Languages open opportunities everywhere and it is important to drill this into the heads of students in the UK. It would be a shame for these students who ‘do NOT care’ in 20 years time to say… “Oh if only I had known”. Read our recent contribution to the Guardian's Q+A about how languages can boost your career.